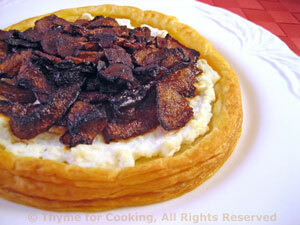 Savory Red Onion and Ricotta Tart, Thyme for Cooking easy gourmet. I used red onions for this, but any sweet onion will work. You want to be careful not to get them too browned in the skillet, as they will brown further in the oven.... Aim for 'mostly' browned. Lay pastry out flat and cut 2 large circles, 5 - 6" in diameter (13 - 15 cm). Use a soup bowl as a guide. Lay the circles on a baking sheet. With a dull knife, lightly score a line about 1/3" (1cm) inside the edge of the pastry. It helps the edges to raise. Roughly chop onion, leaving fairly big pieces. Add onions and cook, stirring frequently, until transparent and starting to brown. Reduce heat to medium-low and cook, slowly, until brown and caramelized, about 15 minutes longer. Divide ricotta and spread on each puff pastry circle to scored line. Divide onions and spread on ricotta.